The hypothetical nuclear area contains the homelands of four proto-languages (shaded). 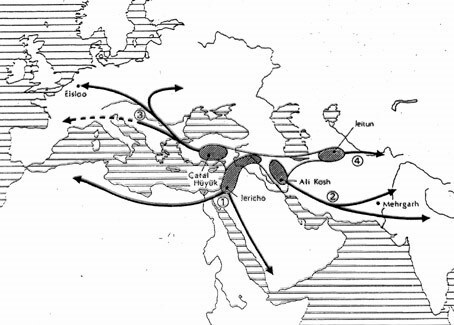 It is hypothesized that farming dispersed processes led to the later distribution of the following language families: (1) Afro-Asiatic, (2) Elamo-Dravidian, (3) Indo-European, (4) Altaic. It should be noted that the hypothetical Nostratic macro-family contains all four language families and that the homeland indicated may be the homeland of proto-Nostratic around 10,000BC. From Renfrew 1991: 13; reproduced by permission of the author and Cambridge University Press.